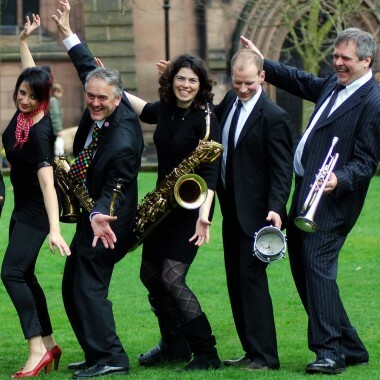 7 piece boogie woogie big band for hire. The Red Stripe Band are a 7 piece band playing jazz, jump jive, rock 'n' roll and wicked big band boogie woogie arrangements with a flexible line up. Versatile young 7 piece band with 3 piece horn section, playing jazz, jump jive, rock ‘n’ roll and wicked big band boogie woogie arrangements. 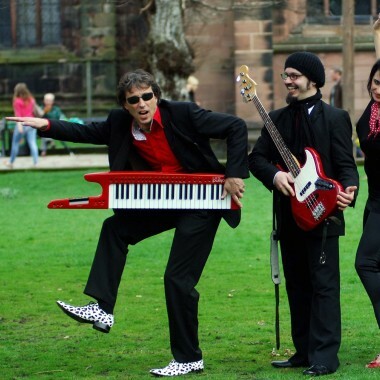 The Red Stripe Band are normally a seven piece band featuring bass, guitar, piano and vocals, drums and a three piece horn section – tenor and baritone sax and trumpet. They can also perform with reduced or enhanced line-ups. Based in London but gigging all over the country, their previous engagements have included several Jazz Festivals including Birmingham, Lichfield, Marlborough, Lyme Regis, Chichester Real Ale & Jazz and a very successful tour of USA’s East Coast, playing with guest artistes including John Martyn, Glen Tilbrook from Squeeze, and Rupert Black of the Pretenders. In the summer the band supported Eddi Reader of Fairground Attraction fame. Satisfied corporate clients include Hanson Group, British Telecom and Barclays Bank to name but a few. The guys have ‘ripped-up’ corporate events and by the end of the evening nobody can keep still – the whole place is jumpin’ ! 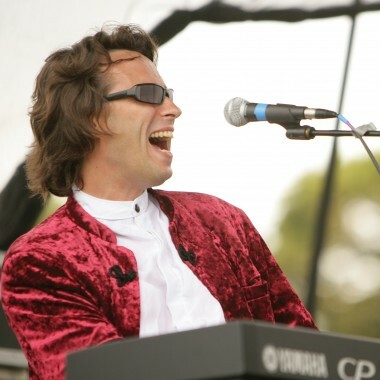 Red Stripe on piano and vocals features some wicked boogie woogie and big band arrangements including ‘Bumble Boogie’, ‘Shake Rattle ‘n’ Roll’, ‘Well Alright’ (Count Basie) – all in true foot tapping boogie woogie style. There is also a good sprinkling of jump jive and rock ‘n’ roll including Louis Jordan and Louis Prima numbers such as ‘Choo Choo Ch Boogie’, ‘Jump Jive ‘n’ Wail’ and ‘Buona Sera’.